Part of the Plinto series, this table features a square top that is made of four elements in white Carrara marble rich in natural veins. The top can also be in travertino marble. Legs are in maple wood, but also available are Italian walnut wood, American dark wood, cheerywood, maple wood, durmast oakwood, or durmast oak with wenge color. The finish of the wood is matte and can be in 16 different hues to choose in the brand's catalog. The design is by Carlo Chiappi and its elegant flair will suit any decor. For more information about customization options, please contact us. 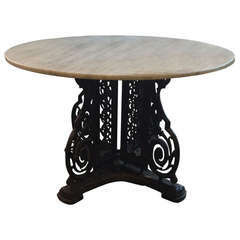 Elegant French reconstituted stone based table with marble slab top from early 20c. Some minor losses to marble and base. 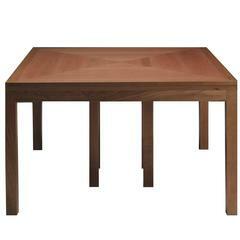 Neoclassical in feel, perfect exterior or interior table.